Skirt: Jcrew (on sale in stores) Shoes: Ann Taylor. Chambray Shirt: GAP (old but similar here). Jacket: Zara. Purse: Celine. Sunglasses: Karen Walker ‘Super Duper’. Nails: Essie ‘Pink Parka’. Jewelry: David Yurman, GAP, BR, Michele, Jcrew, Max&Chloe. Great outfit! Love the pink neon!! Как всегда стильная и модная! You look great, I love those shoes! I love the touches of pink in this outfit, it works brilliantly! Love those shoes too!! Love the skirt and the flats!! I covet that Celine bag so hard. Also love the neon pink in this outfit – looks great! I like your bracelets and of course the skirt, nails and shoes are very good combination! Что за цветы у твоих ног? Очень красиво, правда! You are the best!!! Everytime original! A great casual outfit with a joyous twist! The bright pink is great! And the sunnies look like the ones from Breakfast at Tiffanys. Love this outfit! What a cute shoes! I'm going shopping this today and seriously pinning this outfit to find these pieces. I worn my chambray shirt down to the ground so will hopefully find another one! OMG seriouslr you Look AMAZING, I'm in LOVE with this out fit. You do such a good job of coordinating your outfits!!! The pink on your nails, flats, and skirt makes the look so chic! LOVE IT! What a fresh look. Love it! an effortless urban chic look. i'd love to run around and go coffee in that outfit! Love everything you put together Blair!! My style idol! Perfect outfit for a coffee run and also for running errands!!! I love the colors and everything!!! you're beautiful when you laugh! Gorgeous. Love your shoes and skirt! You look great! Love the beige colours with those hints of pink! You style is such a great inspiration! Love the combination of the pink! Great flats! I love the bright pink! And the last photo you look so happy. Love the touch of pink! I love the color contrast of the skirt and the ballet flats, so pretty! your shoes look great and they look amazing with your skirt! Amazing look! I love the shoes and the bag! I absolutely LOVE the pop of pink! Pink highlights of this spring! Brava! I love the chambray and neon combination! Great styling as always! I haven't seen a skirt like that in years, what a great find! Love the shoes, they make the outfit! I definitely have to kick my coffee runs outfits up a few notches. Last week The Glamourai posted a super chic coffee run outfit, and now you've done the same! Seriously though, this is adorable. Love it. Love the shoes thanks for the link! Ilove pink and the way you wear it in your outfits! Love the pink skirt! You look great! I love the combination of your skirt and heels! Bright pink is my favorite neon hue. You look amazing. I love the neon skirt and the capped flats. so chic and so casual at the same time! love it! Love this outfit!!! Mixing tan with pink neon is very interesting!!! Love the pinks in this outfit with the cap toe shoes and skirt. I love how it looks with the denim shirt. I love the colour combination of this outfit and the fact it looks so comfy and stylish!!! Only a person with legs like yours can wear that length of skirt. Congrats!!!! both you and krystalin (this time tomorrow) are rocking hot pink bottoms – love it! I love the army green with the bright pink! Toughens up the look! Love the Celine bag and the sunglasses! Cute! Loving all the pops of pink. Loving the dash of pink! Love your pink outfit… And your bag colour… Perfect together!! Relaxed yet fun and feminine! Awesome Outfit!!! I Love your style!!!! Awesome Outfit!!!! Love your style!!! wow this looks so great never thought of combining my jeans blouse to a pink skirt great idea! So pretty! I really love your blog. you are so chic and i need your shoes. I'm loving the hints of pink, so fresh! Love your outfit! That color combination is great. I really love your style! What a great outfit! It's perfect for spring–and I love that jacket!! absolutely adore this outfit. the perfect pop of shocking pink. xoxo. Love that bag and your super fun flats! Chic as usual! Love the pink detail. Adore the hot pink accents! Simply chic. Ahhhh your skirt is so punchy and great!! I'm obsessed. And your layering is to-die-for as always! Love how you tied in the pink from your shoes to the pink skirt! And, love the use of chambray. Gorgeous! I love the pink accents! i'm obsessed with every inch of this ensemble! i need a chambray shirt pronto. The pop of pink is so much fun and I'm drawn to pointed flats! Just bought another pair with a contrast toe cap. I love all of the pink in this outfit. Those shoes are amazing. Love the shoes and the matching skirt! love all of the matchy matchy PINK! cute! Every time your look is amazing! ¡This is my favorite blog!…You're the best!!! Aw, Bee! I love this! The neon pink mini & the cap toed shoes are adorable! And loving these sunnies on you!! xo. Love that look! Specially the skirt neon connection with the shoes! I love those shoes, I wish had some like that. You look so happy hope you're having a good weekend. Fantastic outfit! I absolutely love it! Beautiful,love your bag and your flats!! I love the neon pink!!! i absolutely love this combination! it's so cute!! i love the hints of hot pink and how they match!! have you moved to NYC? so jealous!!! love those pops of pink and the shoes are so sweet! Looks like you're having fun in NYC!! I'm not really a pink person – but the shoes are super perfect! Love this look ! I also have a giveaway that will end tonight. Blair why must you be so fabulous!? Adorable pink capped shoes. I got a pedi using the same neon pink today. Love the pop of neon! Tried a similar outfit Friday with chambray and neon orange….got so many compliments, and "likes" on Instagram and Pose! Beautiful blog as always, you are a fabulous style inspiration. Love from the Atlantic coast! Your flats are adorable and I love the jacket! Perfect for a weekend grabbing coffee.. I'm usually in work out pants and a sweatshirt. LOL you look amazing!! Love the pops of pink!! Beautiful look for a casual day! I love the fuxcia and beige combination. In love with the cap toe ballerinas! Wow , you look so feminine , I so adore you !!! Loving all of the neon + chambray combos I've seen lately! obsessed with the neon tips on your shoes! and of course always love your outfits! She is looking very gorgeous in that pink based outfit. Loved this combination. Angelina Clarke from Gold Clutches . Neon pink rocks in all possible ways! Lovely spring outfit! Your shoes look fab! Great skirt!! Love the pinks! love, love, love the shoes – amazing! but my first BIG love is your amazing pearl necklace(!!! always and forever). Looks so cheerful and comfortable, defintely something I'd love to wear. Beautiful outfit, love the way you styled it. All the accessories add a perfect finish. Cute! I love the pink toe on that shoe! I love those shoes with the pop of pink on the toes – gorgeous! Love your personal style, so fun and easy going. The pink mini is too cool. Super cute look! Loving your hotpink point flats! love that skirt and the shoes are perfect with it! Amazing pumps – such a great look! Love the hot pink touches. Wish I looked this cute when I get coffee. You look so cute! Casual yet sophisticated. I love it! Very beautiful styling … – the combination of skirt and heels is perfect…! The neon skirt is so pretty! This outfit is awesome. I'm dying over those shoes and pink skirt. LOVE! Love the bright skirt and bright pink accent on the flats. The neutral and pink is totally what I'm rocking on my nails! I love your pink skirt!!! love the shoes! perfect mix of neutrals and neon!! pink pink pink! love it! The bright pink pop of color on the flats is perfect. Love the pop of color! shoes are amazing. LOVE the pop of pink!! Somad the shoes are not available in this color anymore!!! Congrats for your blog and of course for your style! These pics are really amazing and i will love to see all of these pics. I love those POPs of pink. So gorgeous! very cute look. Very stylish combo indeed. Your second picture captures everything perfectly, including the spring feel with the petal scattered sidewalk. Love this combination! Those flats are to die for! Those shoes are so sweet! I absolutely LOVE those flats! I cannot get enough of your neon pink accents, so cute! wonderful look! so beautiful pink! the pop of pink of the shoes is really nice. If you like bags, check out some great bags I came across in a london market on my latest post. What color leather and size is your Celine luggage tote? i don't think i could ever say one bad thing about your style. its sheer perfection. Stumbled upon your blog 🙂 You are simply fabulous. 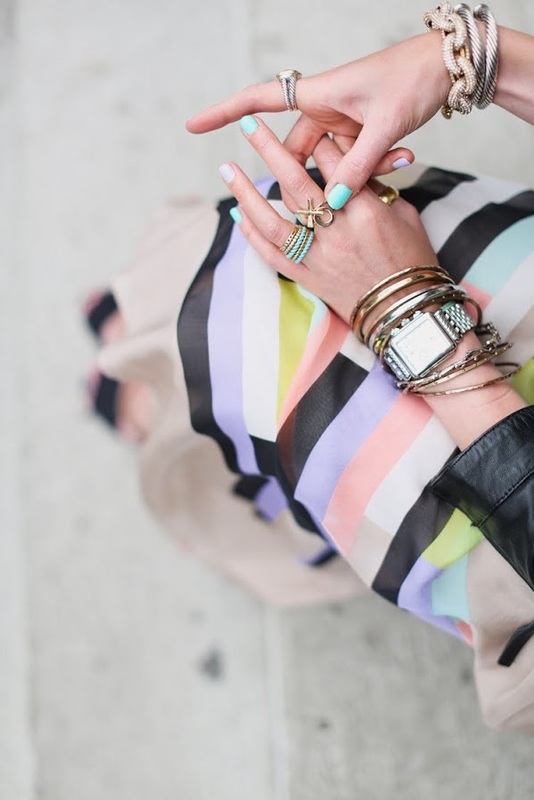 Crazy for those neon pieces!Love how you matched the colors perfectly! Fantastic way to wear neon! I'm inspired! Love your shoes and the hint of neon! You have such a great taste of style! Woow I love the combination of khaki and pink! perfect mix!and the shoes are amazing! wow soo busy here 😀 loe the pink colour burst! Blair I love your style! This outfit is simple and yet so inspiring and it can look great on so many body types. I love her looks, always wonderful! Beautiful and so put together! I love it!! Perfect casual outfit with a little pink twist!! Love it! I love this ladies shoes! they are awesome! I very rarely even notice flats as I am a platform girl, but the pop of pink is so pretty I couldn't resist. Love the shoes! Have the same pair actually. Check out my fashion blog too! Wow, those shoes r fantastic! Loving the pop of pink and the bag of course! So cute! pop of pink! the not-so-subtle hints of hot pink are TOO cute! perfect pair of spring flats! I love the tip of pink on the shoes!! Woooooow! precioso blog!! me encantan tus looks!! This outfit is insanely adorable!! This one is perfect. I love how the colours all work together, the touches of pink make everything more lively and fun. Great styling!